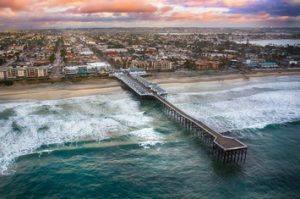 Nestled in between Mission Beach and La Jolla, Pacific Beach offers a wide array offers a wide array of bars, restaurants, and shopping, all in close proximity to its sweeping white sand beach. Although it has been long considered a youthful community populated by surfers and college students, rising property values and rental costs have gradually shifted the community towards an older and more affluent population. Hemmed in by the ocean to the west, Pacific Beach makes the most of its location, wrapping the beach with an ocean-front boardwalk that stretches 3.2 miles through Pacific and Mission beach, providing the opportunity, to bicycle, skateboard, rollerblade, jog along the ocean front, or just take in the vibrant scene of tourists and locals that flock to Pacific Beach in the summer.In the heart of Pacific Beach, historic Crystal Pier provides public access for fishing and a vantage point to admire the coast. Built in the late 1920s, Crystal Pier added cottages in 1930 that are still rented by vacationers today. Pacific Beach’s youthful ocean lifestyle attracts a wide range of people to its varied neighborhoods. From the family-oriented North Pacific Beach to the youthful downtown Pacific Beach, I can help you find the right house to call home.